Vitamin D is a fat-soluble vitamin that is not found naturally in many foods. It plays three key roles in our bodies. The first and simplest is bone development. The primary role of this vitamin is to facilitate the uptake of calcium from our food, through the lining of the small intestine into our blood. It also controls the deposition of calcium in the bones during growth and maintains adult bone structure. This is essential to absorbing and using calcium properly. But vitamin D is also vital for maintaining a healthy hormonal balance and regulating our moods. Those last two functions naturally have an effect on our general health and wellbeing. As we grow older we are at risk of a whole host of conditions. Osteoporosis, depression, and hormonal imbalances are common complaints. For women over the age of 50, these are particularly marked. By ensuring we have enough vitamin D we can help to avoid the worst of these conditions. How Much Should We Be Taking? Because it is more a hormone than a vitamin, vitamin D is measured in international units, or IU. We need 400 IU of vitamin D a day, minimum, to do well. How do I Know if I am Getting My Proper Daily Dose? As long as you get daily exposure to sunlight, you are guaranteed to get enough vitamin D.
It can be synthesised below the surface of the skin in the presence of ultraviolet (UV-B) light. Just getting 20 minutes of sun on your skin can help you make in the region of 10,000 IU, and as it is fat soluble you can store a lot of that, giving you plenty. However, in the Northern Hemispheres you are at risk of deficiency, due to long and cold winters. You need to consider that the beneficial effect of sunlight, in playing a part in vitamin D synthesis, has to be balanced with the detrimental effect its role has in causing skin cancers. Therefore you want to make sure you are not exposing yourself when the sun is at its highest. If you cannot get sun on your skin for at least five minutes a day, three days a week, you may need a supplement. Also, if you are a dark skinned person living in a cold climate you may need a supplement too, as melanin inhibits vitamin D3 production. Can I Overdo it with vitamin D? 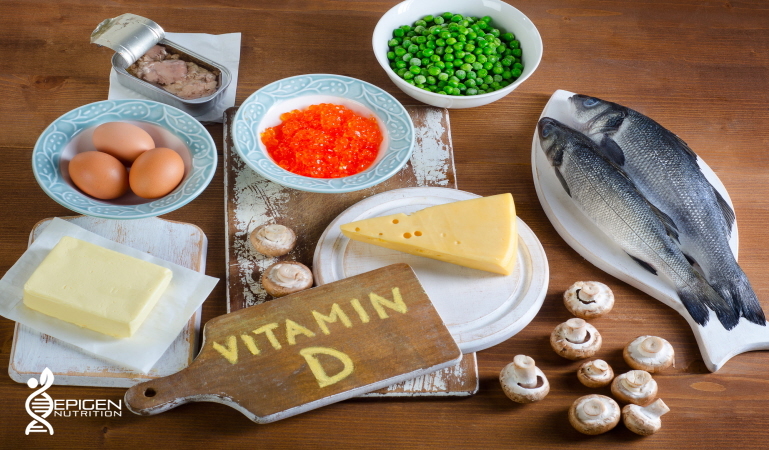 Going over the top with too many vitamin D supplements over a long period of time can cause you to build up too much calcium in the body (hypercalcaemia). This can weaken the bones and cause damage to the heart and kidneys. If you choose to take vitamin D supplements, 5-10mcg a day will be enough for most people. Don’t take more than 100mcg of vitamin D a day as it could be harmful. Beneficial for: By retaining calcium it helps to maintain strong and healthy bones. It also helps to regulate the immune system and immune cells. Signs of Being Deficient: Bone deformities such as rickets and osteoporosis can result due to long term deficiency. Joint pain or stiffness. Backache, tooth decay, muscle cramps and hair loss. Bone pain in adults caused by a condition called osteomalacia. Frequent illnesses, low levels of mood, lethargy, tiredness, and general weakness. These symptoms can get worse as the deficiency develops, culminating in clinical depression and even neurological disorders. Good Food Sources: Mackerel, herrings, salmon, swordfish, tuna, oysters, sardines. Eggs, cottage cheese, margarine. Fortified foods such as: bread, powdered milks, breakfast cereals and yoghurt. Absorption Assisters: Enough exposure to sunlight, as vitamin D is made in the skin. Vitamins A, C and E help to protect Vitamin D.
Absorption Inhibitors: Fried foods and lack of sunlight. NB: Absorption assisters and inhibitors are factors that will either help or hinder the absorption of the specific nutrient into the body, for the best effect. To make the most of the positive effects of the nutrient, you should either minimise or eliminate the inhibitor when consuming it.